There have been a couple of successful lawsuits over this, against Seagate and Creative, for using base-10 versus base-2 (binary calculation is what the industry uses, but apparently marketing has been using base-10 to make their hard drives seem larger). I agree that it's the logical (not natural) way to measure, but then calling it kilo is still plain wrong IMO, since it's the ISO prefix for 1000. IMO deviating from ISO standards is faulty. By not working with the standards that are in place confusion is caused. Damn right - the Standards exist for a reason, and deviation from them is sufficient (for myself at least) to deem a product not fit for purpose. Surely you are right about the standards guys, but the use of kb, mb, etc. 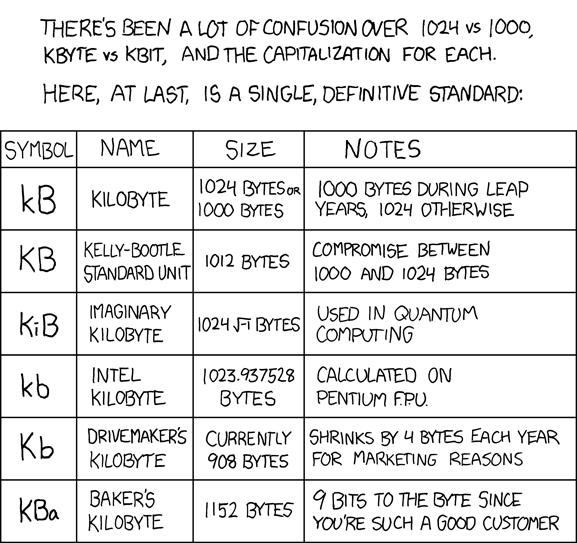 between computer users always has been 1kb = 1024 bytes. My Computation teacher in 5th fought a lot to remove the decimal way of thinking from our heads. Quoting Wittgenstein, "Meaning is just use". In that context, hardware manufacturers have the right or not to use k = 1000 depending on the rules you use to judge. Independent from the definition of kilo, the use in computers is 1 k = 1024. In the other hand hardware manufacturers are following a rule as The Headacher points. Therefore, the rule you want to use to judge will make the difference. I vote for "use" in this case. What other prefix are they supposed to use?